Superb Internet is an award-winning company that provides Web Hosting, Virtual Private Servers, and Dedicated Servers to over 150 countries worldwide. From their on-site certified technicians to their promise of a thirty minute response time, Superb strives to provide the best customer service and network monitoring available 24 hours a day, 7 days a week. Dedicated server packages include a 10 Mbps port with unlimited traffic. Their dedicated servers are also offered in corporate and enterprise levels that include more RAM, or you can opt for an upgrade to a 100 Mbps port that has limited traffic allowances. Virtual Private Server Hosting that allows customers to choose their own operating systems, and provides administrative access directly from the control panel. Each VPS system has the option of adding patches and updates, operating system hardening, and proactive monitoring services, with additional options for managed backup on Windows based servers or On-Demand backup for Linux servers. The VPS service is available in several different package levels including the Mini, Lite, Standard, Pro, Max, Enterprise, and Ultimate, each with their own levels of RAM, disk space, and bandwidth. Colocation services for internet-based providers that choose to store their own servers off-site in a climate-controlled, secure environment. Superb’s off-site storage centers are all fire-proof, under 24/7 video surveillance, and contain back-up generators to maintain the power supply to all servers. Colocation services are available both for individual servers and complete racks. GridIron® Web Hosting for both Linux and Windows platforms that are powered by load-balanced server clusters. Web hosting services are available in three different packages that all include free 30 minute tech support and free apps. Superb Internet has a wide range of pricing for each of the services they provide. The 5-in-1 managed services bundle is $99 per month, plus the price of the chosen server and a $25 – $124 setup fee. Server availability is broken down into three levels. Budget servers range from $248 for 2 GB of RAM up to $919 for 32 GB. The Corporate dedicated servers range in price from $248 to $919, and the Enterprise dedicated servers cost from $248 to $478. Superb’s dedicated server services are available starting at $39 for the 10 Mbps port with unlimited traffic. Upgrades are offered at an additional $15 for 100 Mbps, or $99 for a GigE port, each of which comes with limited traffic and a $95 per 500 GB overage fee. Virtual Private Server hosting services are also broken down into individual plans with monthly charges; the Mini starting at $25, the Lite ($40), the Standard ($55), the Pro ($70), the Max ($120), the Enterprise ($250), and the Ultimate ($475). Superb offers their collocation services for both single servers and racks. The single server option comes with 4000 GB for $99, but pricing may increase depending on the server size. Their rack option is $875 for a single unit, with options for custom cages. Both service options also require a setup fee, with additional charges for add-ons. 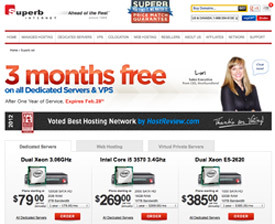 The cheapest service Superb offers is their web hosting. Linux based hosting starts at $4.99 per month for 20 GB, $6.99 for 200 GB, and $14.99 for unlimited space. Windows based platforms are slightly higher, with plans starting at $8.50 for 50 GB, $12.50 for 200 GB, and 100 GB starting at $18.00 per month. Superb is an award-winning company that provides solutions for many businesses, but depending on the organization’s needs, they can become quite expensive. Depending on the options needed, there are additional fees and charges that are added for many of their packages. In order to make sure your company gets the best options at the right price, make sure to read any fine print before signing up to ensure you know what you are really paying for. Another thing to be aware of is that they only have 3 data centers; two in Virginia, and one in Washington. If your organization is looking for an easily-accessible location, Superb may require some traveling depending on where your business is located. Superb strives to be number one with their customer support. They guarantee a response time of 30 minutes for all inquiries, and have on-site, fully certified ITIL technicians that are available 24/7 365 days a year. Superb guarantees 100% server uptime and facilities that are fully equipped with redundant cooling systems, fire proof, and every location has complete disaster plans in place in order to be prepared for anything. Their infrastructure, which they own, is designed with no points of failure, and is monitored constantly. Every customer has access to a complete knowledge base, dedicated and main customer support phone numbers, online chat services, and a fully automated support ticket site that is always available so any issues are answered quickly and efficiently. Their customer support is also backed by several awards, including the “Editor’s Choice Award” for game servers, the “Dedicated Sever Hosting Award”, and the “Most Popular Backup Host Award”. Most recently, they were recognized as a Top Pick Web Host in 2012. Superb Internet offers internet services for nearly any size organization with completely customizable plans, and they are fully prepared for every eventuality. They strive to provide the best services possible, and are often on the forefront of new technology and innovations. Between numerous awards, guaranteed uptime, and a thirty minute response for all issues their record for providing great service speaks for itself. If your organization is looking for Web Hosting, Virtual Private Servers, or Dedicated Servers Superb is definitely an option that should be considered.